Save big on Novus Prime outfits this week in North America! 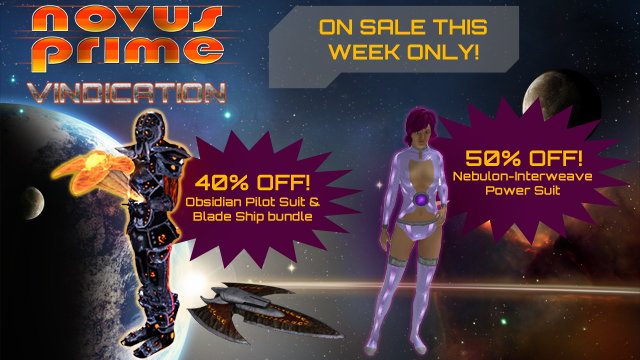 Two of Novus Prime‘s most popular outfits are on sale this week only! Save 40% on the mysterious Obsidian Pilot outfit & Blade fighter ship bundle, and take futuristic fashion to the next level with the Nebulon-Interweave Power Suit for 50% off. And don’t forget, owners of the Obsidian Pilot outfit save 20% on the new Obsidian Bladewalker suit! Visit the Novus Prime space station today, and act fast – this sale ends Sunday, May 13th!